After being stripped of his knighthood for treason and cast out from high society, Crispin Guest has reinvented himself as the Tracker, an investigator who can find anything and anyone. When Grayce, a distraught scullery maid arrives on his doorstep, frantic after finding a dead man in her room, Crispin examines the scene of what he thinks is a straightforward murder. After learning that the murdered man was an important courier in possession of a dangerous holy artifact, an object so valuable its absence could begin a war between empires, he quickly realizes this is no ordinary case. During his investigation, Guest unexpectedly encounters his nemesis, Miles Aleyn, the treasonous mastermind behind his fall from grace. Aleyn is acting suspiciously, and Guest must conquer his desire for revenge to find out just what he may be hiding. Surrounded by possible suspects, Guest will have to use his wiles to navigate both the exclusive halls of King Richard’s court, and the hardscrabble streets of 14th century London. In a world full of old friends, mysterious strangers and dangerous enemies, he will have to uncover lies well told and truth well hidden to find the murderer, protect his country and save himself. 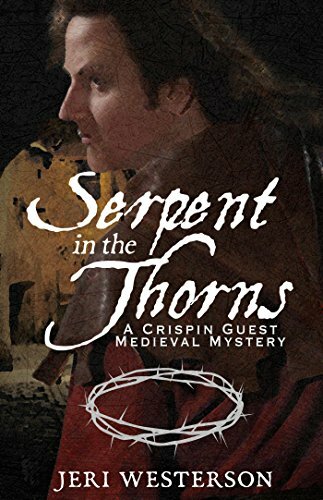 The riveting second mystery in the Crispin Guest series is an evocative and thrilling medieval noir tale of suspense and murder. Serpent in the Thorns was a finalist for both the Macavity Award and the Bruce Alexander Mystery Award.